Each of our mouse pads are proudly made in the USA at our Scottsboro, Alabama facilities with sharp, colorful graphics. The pads measure 9" in width by 7 3/4" in height and are 1/4" thick. 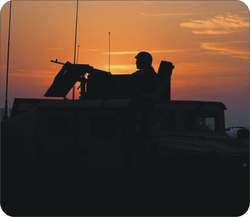 This 1st Cavalry on patrol mouse pad features A Soldier from the 1st Brigade Combat Team, 1st Cavalry Division, as he patrols Salman Pak, Iraq. Photo taken January 6, 2005 by Spc. Jan Critchfield and is courtesy of the U.S. Army.